These seeds are prestratified: plant 1 cm (0.4 in) deep in early spring for germination in late spring. Best grown in deep plugs or containers, can be transplanted in 1st or 2nd year. 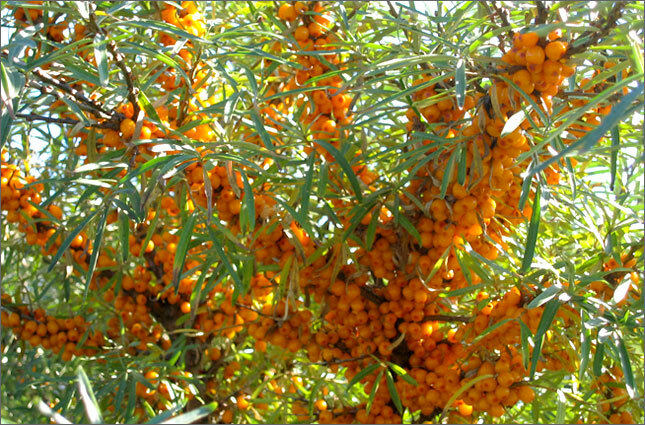 Careful situating as Seabuckthorn can send out long runners. Bushes will grow to 4.5 m (15 ft) tall and are dioecious - both male and females are needed for production of tart but tasty orange berries, which make a delicious juice, sauce, jelly or a sweetener for tea. Leaves are used for tea too.